We don’t just provide health care; we build relationships. We’re familiar with the struggle of seeking relief through conventional medicine, only to find that the doctors can’t help you. If you’ve spent weeks, months, or perhaps even years searching for a solution for long-standing problems, our center for regenerative medicine can be your new primary resource. While some of our patients came to our health & wellness center in Los Angeles with serious medical conditions, many come to us because they feel tired, depressed, or out-of-sync. With our state-of-the-art facility and equipment, we offer advanced testing and diagnosis methods which have helped over 4,000 patients rediscover their energy, vitality, and joy in life. 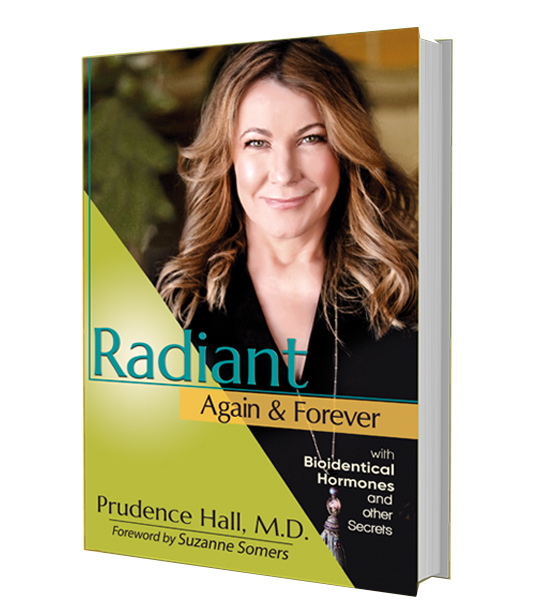 Thank you, you will receive the copy of Radiant Again & Forever shortly! Dr. Prudence Hall, Founder and Medical Director of The Hall Center, is a physician with a vision. A traditional gynecological surgeon and practitioner turned pioneer of regenerative and integrated medicine, Dr. Hall foresees a future where “average” and “normal” are no longer acceptable standards of health. Instead, she strives to help clients achieve optimal health and actively prevent disease without the use of pharmaceutical drugs when appropriate. If you’re tired of doctors treating your symptoms instead of trying to find the root of your problem, you’ve come to the right place. Our regenerative medicine practice is different; we strive to identify the cause of your condition. We offer a number of programs to treat your biochemical imbalances on a cellular level. From natural weight loss programs to thyroid treatment services, our center for regenerative medicine provides solutions for many ailments. Our nurturing environment and friendly team ensure you can get back to the best part of your life: living it. Many people experiencing sleeplessness, lack of energy, and depression may not always realize that they’re suffering. They may even think that these new problems are just a natural part of aging. At The Hall Center, we don’t believe in succumbing to these issues—we believe in returning men and women of all ages to their optimal health. If you’re struggling with sleeplessness, fatigue, depression and anxiety, weight gain, hair loss, acne, menopause, PMS, or heart health, our center for regenerative medicine can help! Visit our health and wellness center in Los Angeles today.